Good use of tax dollars? Remember the reason for this multi-million expenditure of tax dollars?? Perhaps we could ask Mr. Kenning, or Ms Clift or the original engineer or Mr. Swabey ....... unfortunately they are no longer in the employ of the city. And city Councillors encouraged to 'get on with it' have lost any appetite they might have once had to get to the bottom of how exactly Nanaimo went through three years and three million dollars to prevent an event that had minimal consequence in a worst case scenario. If you want to see how a few million tax dollars are being flushed down the drain, take a walk at Colliery Dams when this monstrosity of a ditch is finished. Taxes going up to support needed services, is one thing, going up to support this kind of effort is quite another. The Queen of Alberni will be removed from service on the Tsawwassen - Duke Point route December 29, 2015 to January 7, 2016 for unscheduled maintenance. During this time, the Queen of New Westminster will sail in place of the Queen of Alberni on the same schedule. Commercial operators please note that the Queen of New Westminster has a height clearance of 13’8” and width of 12’ as compared to the 15’4” height clearance and width of 14’ on the Queen of Alberni. 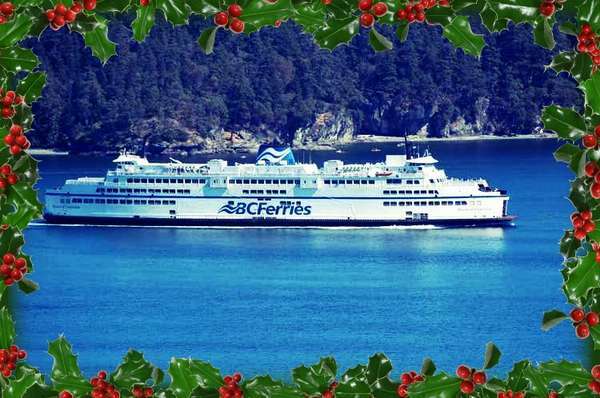 BC Ferries apologizes for any inconvenience as a result of this unscheduled maintenance and we look forward to the Queen of Alberni returning to service on January 8, 2016. 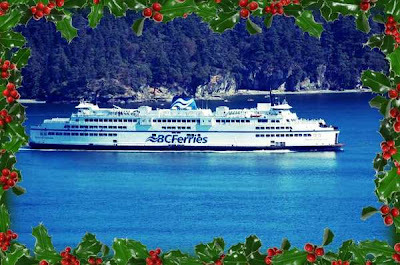 For reservations or additional sailing information please visit www.bcferries.com or call 1-888 BCFERRY (888-223-3779). Nanaimo Search and Rescue tree chipping fundraiser in the Country Club Mall lot near Dairy Queen 12:00 am - 4:00 pm Jan.2 & 3. Chipping is by donation to Nanaimo Search and Rescue. 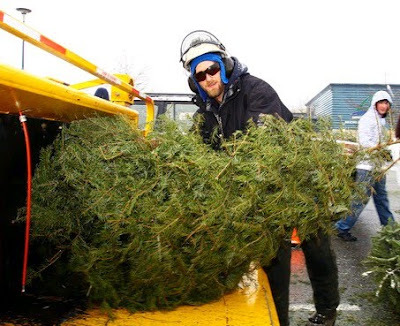 Nanaimo SPCA are having a tree chipping event at Brook's Landing Mall, 2000 Island Hwy. North from 11:00am - 3:00pm on both Jan. 2 and Jan. 3. First Neck Point Scout Group are having a tree chipping and bottle drive fundraiser at Woodgrove Centre (next to White Spot) from 9:00 am - 4:00 pm Jan. 2 and Jan. 3. By donation to the Scouts. Nananimo Lion's Club Jan. 9 & 10 - 10:00 am - 4:00 pm Nanaimo North Town Centre, Southwest parking lot. The Queen of Alberni will be removed from service on the Tsawwassen - Duke Point route December 29th, 2015 for unscheduled maintenance. During this time, the Queen of New Westminster will sail in place of the Queen of Alberni on the same schedule. Commercial operators please note that the Queen of New Westminster has a height clearance of 13’8” and width of 12’ as compared to the 15’4” height clearance and width of 14’ on the Queen of Alberni. Another huge effort this year by the regular staff bolstered by an army of volunteers has seen Hamperville distribute hampers to 4651 people representing 2135 different households. More than 1275 individuals and groups came alongside the regular staff to receive, sort and deliver a mountain of food to those in Nanaimo who are in need. Loaves and Fishes will resume regular hours of operation again starting January 4/16. Councillor Fuller spent his night before Christmas cooking up many turkeys which made the Christmas Dinner at Generations Church another welcome event for many in Nanaimo. The breakfast, lunch and dinner provided by the 7-10 club is made possible by many,many volunteers coming together under the direction of Gord who took it upon himself last year to put on a Christmas Day dinner when he found out no one else in town was doing one. Kudos to Gord and the many who volunteered food and time to make this day a whole lot nicer for many appreciative folk. Both of these events are an example of how caring and giving Nanaimo can be. It would be delightful though if none of these efforts were necessary. This Huffpost article points to six traps that could cause the Canadian economy grief in 2016. Among the list of potential snares includes the fact investors have been 'shorting' Canadian stocks, banks, Loonie, real estate and anything else they can get against. That is why the Loonie is where it is at and the TSX loosing 12% this past year. Also highlighted was the fact nearly 300,000 Canadian families have dangerous levels of debt. With a 30% decline in house prices 294,000 Canadian households would be under water. Mortgage fraud and other housing shenanigans are listed as another threat to our economy. The article goes on to claim that the OPEC cartel are flooding the market with cheap oil in an attempt to but US shale out of business. 1. Nanaimo file # 2015-36364 On Monday December 14th, and between 10 am and 12 pm, a Ford Escape parked in the 3800 block of Stronach Drive was broken into. The unlocked vehicle was rummaged through and belongings strewn on street. 2. Nanaimo file # 2015-36378 On Monday December 14th, a male had his "man purse" stolen by an unknown male, as he walked through the alleyway behind 475 Nicol St. The victim was riding his medical scooter when all of a sudden the suspect came from behind, grabbed his shoulder bag then ran down the alleyway with it. The suspect is a FN male, 20-25 years of age, 5 ft. 6, and stocky. He was wearing a large black jacket with a reflective "X" on the back. 4. Nanaimo file # 2015-36533 On Wednesday December 16th, an unknown person stole an I-phone and an I-pad mini from a bus at 321 Wallace St. The serial # of the I-phone is 013847009377606. 5. Nanaimo file # 2015-36915 On Sunday December 20th, a mountain bike was stolen from 645 Selby St. The bike was bolted outside the owner's window, has a 28" frame, is silver, black and purple and shocks on the front and back. The suspect is white, approximately 20 years old, 5 ft. 8- 5 ft. 10 and wore a black hoodie. 6. Nanaimo file # 2015-36961 On Sunday December 20th, it was reported a garage at 145 Prideaux St was broken. The break in occurred sometime between 6 pm on December 19th and 11 am on the 20th. It did not appear anything was taken. 7. 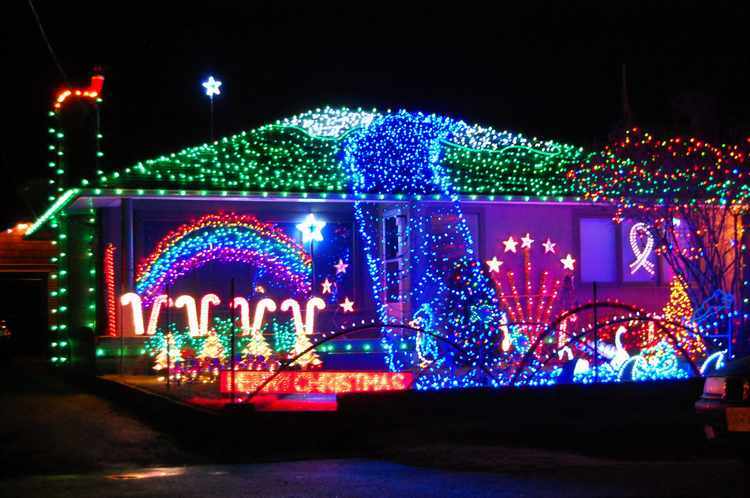 Nanaimo file # 2015-36965 On Sunday December 20th, a home in the 2100 block of Cinnabar Dr was broken into. Point of entry was the rear balcony, accessed by a step ladder. A number of totes were emptied then used to remove items from the home. Taken were dozens of DVD's, Wii games, Wii console, Xbox console, flat screen TV, 5 pieces of Pandora jewelry and 2 Dell laptops (1 silver, 1 with a lime green). Commercial operators are reminded that the Queen of New Westminster is a smaller vessel and has a max height clearance of 13'8" and width of 12'. For traffic updates or more information please call us toll free at 1-888-BCFERRY (223-3779), check our website at www.bcferries.com or go tohttp://mobile.bcferries.com on your mobile device. 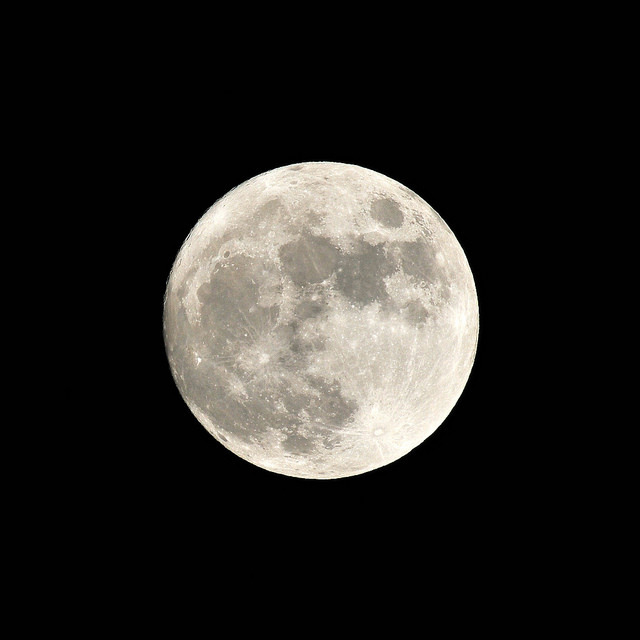 We won’t have another full moon on a Christmas Day until 2034. A 19-year cycle of the moon is the reason. Amazingly, the moon’s phases recur on (or near) the same calendar dates every 19 years. This cycle – known as the Metonic cycle – happens because 235 returns to full moon almost exactly equal 19 years. So, in other words, the phases of the moon realign (or nearly realign) with the same calendar dates every 19 years. We just missed a full moon on Christmas 19 years ago; instead, the full moon fell on Christmas Eve. It was December 24, 1996 at 20:41 Universal Time, or UT. But two Metonic cycles ago – 38 years (or 2 X 19 years) – the full moon fell on Christmas Day. That full moon happened on December 25, 1977 at 12:49 UT. Snowfall, with total amounts of about 5 cm is expected. A Pacific frontal system is bringing snow to the northern sections of East Vancouver Island. Total snowfall amount of 5 cm is expected. Snow will transition to rain later today as temperatures rise above freezing. Poor driving conditions can be expected on the Inland Island Highway. Be prepared to adjust your driving with changing road conditions. Visibility may be suddenly reduced at times in heavy snow. Please continue to monitor alerts and forecasts issued by Environment Canada. To report severe weather, send an email to pacificstorm@ec.gc.ca or tweet reports to #BCStorm. Boxing Day is a holiday traditionally celebrated the day following Christmas Day, when servants and tradesmen would receive gifts, known as a "Christmas box", from their bosses or employers,in the United Kingdom, Barbados, Canada, Hong Kong, Australia, Bermuda, New Zealand, Kenya, South Africa, Guyana, Trinidad and Tobago, Jamaica and other former British colonies. Today, Boxing Day is the bank holiday that generally takes place on 26 December. The Nanaimo RCMP is asking for the public's assistance in identifying the male shown in the attached photo. This individual was in Nanaimo on Sunday afternoon December 20th, and is considered a person of interest in an ongoing police investigation. He may have information which could assist in the investigation. The word is getting out this year- drinking and driving is not acceptable. This past Friday and Saturday night, ORN safely escorted home 278 partygoers, delivering 128 vehicles, driving over 3000 kilometres and raising an impressive $3602.05. All proceeds of course go to supporting deserving athletes and programs with Pacific Sport. Like other community minded programs, ORN could not survive if it wasn't for the hundreds of volunteers and corporate volunteers, proudly donning their ORN vests to meander the streets of Nanaimo, escorting people home. An interesting trend developing this year is the number of young adults, 18-21, using the service. “From a policing perspective, this is encouraging and shows us new drivers are just as responsible as others and realize drinking and driving can have deadly consequences" said Constable Gary O'Brien, RCMP liaison for ORN. Nanaimo City Council’s Nominating Committee for the Nanaimo Economic Development Corporation (NEDC) is accepting nominations for exemplary leaders in our community to actively participate on the Board of Directors of the NEDC. The NEDC is an arm’s length for-profit corporation owned by the City of Nanaimo created to provide economic development and tourism services to the greater Nanaimo area. The NEDC Directors are an integral component of the Corporation’s effectiveness and credibility and are responsible for setting NEDC’s strategic and policy direction. If you are prepared to make a three year commitment, have exemplary leadership skills in running dynamic organizations; understand Board governance; and have the passion to commit to governing the NEDC, please prepare a submission in writing outlining your background and interest in the NEDC. The Nominating Committee is accepting written submissions until 4:00 p.m. Thursday, January 21, 2016. A seat belt is believed to have saved a 24 year old female from serious injuries after she lost control of her vehicle on icy roads this morning then collided with a telephone pole. The accident occurred on Norwell Drive near 104 St at approximately 6:10 am. The female was on her way to work, driving an older model Toyota Corolla, when she lost control, spun out and struck the pole. She was knocked unconscious for upwards of ten minutes. Attending fire crews were required to use “jaws of life`` to extricate her from her vehicle. She regained consciousness at the scene and was transported to hospital, where she was treated for non- life threatening facial injuries. The road conditions were so treacherous, first responders also had difficulty stopping safely at the scene of the accident. "The cold spell is expected to remain for the next couple of days and with that, icy roads should be considered the norm. Motorists are advised to drive with caution, reduce their speed and leave sufficient space between them and the vehicle travelling in front" said Constable Gary O'Brien of the Nanaimo RCMP. CHEK News reports a group of about twenty protesters delayed a number of logging trucks at Duke Point to draw attention to the logging of old growth timber in the Walbran Valley. The City of Nanaimo is pleased to once again host its annual premier family New Year's celebration, Finale, on December 31 from 5:00 pm to 10:00 pm in Beban Park. This year's theme is 1950s Rock 'n Roll and will include live entertainment, swimming, skating, face painting, crafts, a rock and roll selfie station, food vendors and two countdowns. Live entertainment will feature music by The Big Mess and Ian Johnstone and children's entertainment by The Purple Pirate. The Nanaimo Clippers will also be on hand to skate with on ice and to play hockey. Tickets are $10 per person, $32 for a family of five and children two years and under will receive free admission. Tickets can be purchased at Beban Park Box Office. Countdowns will be at 8:00 pm and 10:00 pm. 1. Nanaimo File # 2015-36140 On Saturday December 12, a break and enter was reported to a home in the 900 block of Townsite Rd. Point of entry was through the basement door. Taken was a 42" Toshiba TV, terabite drive, USB station, 2 plastic totes containing approximately 50 masks from the South Pacific and various paintings. 2. Nanaimo File # 2015-36098 On Saturday December 12, a male delivering pizza on Connaught St was confronted by two males who stole his pizza from him then took off on foot into nearby bushes. One of the males was wearing a black hoodie with a white shirt underneath and black pants. The other male wore grey pants, a gray hat and black jacket. 3. Nanaimo File # 2105-36302 On Monday December 14, at 7:25 am a female was confronted when found rummaging through a green SUV parked in the 700 block of Drake St. The suspect female then ran off and is described as white, heavy set and approximately 5 ft. 5. 4. Nanaimo File # 2015-36352 On Monday December 14, a laptop was reported stolen from BC Hydro, located at 400 Madsen Rd. The laptop was taken sometime between December 7th and December 11th and is a Lenovo ThinkPad T450 serial # PC06KSLL. 5. Nanaimo File # 2015-36306 On Monday December 14, copper wire was stolen from the Green Lake trestle off Aulds Rd. A PVC pipe that runs along the length of the trestle was broken at each end and the wires removed. Two wires were #6 and spanned approximately 200 feet. 6. Nanaimo File # 2015-36441 On Tuesday December 15, a home in the 5000 block of Somerset Drive was broken into. Point of entry was through a side window. A surveillance video and passwords to the computer were stolen. 7. Nanaimo File # 2015-36406 On Tuesday December 15, a Ford F150 parked in the driveway of a home in the 800 block of Linwood Lane was broken into. A garage door opener was taken from the vehicle and then used to open the garage door and took beer from a fridge in the garage. 8. Nanaimo File # 2015-36648 On Thursday December 17, at approximately 2 pm a female stole a purse from another female who was walking along Front St near Anchor Way. The suspect is white with sores on her face, mid 20"s and very thin. Nothing of value was in the purse other than some loose change. Of course I realize that whatever tradition you hold will be your traditional Christmas dinner. What follows is what I would call our traditional dinner menu which our family have shared for about as long as I can remember. The centerpiece of course is the perfectly roasted turkey which has been filling the house with an inviting smell for the last hour or two. Over the years I have found that the extra paid for a fresh bird is worth the few extra dollars when compared with a frozen bird. That is not to say I have not been pleased with the results of the frozen fowl, but simply have found the fresh to be more tender and without a doubt more juicy. Freezing and thawing takes something from any type of meat, and the turkey is no exception. 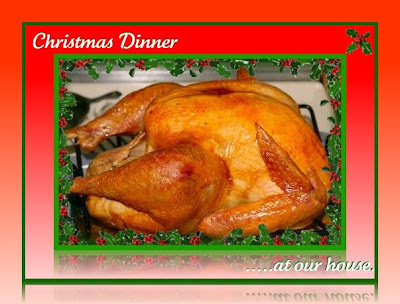 Cooking times will vary depending upon the size of bird chosen and also whether you cook it stuffed or unstuffed. The brand of turkey we buy has a cooking guide printed on the package which I have always found to be accurate. Of course this is also dependent upon the accuracy of the temperature in your oven. A few dollars spent on a thermometer placed in the oven helps determine how accurate your oven dial setting is. In the end, it is always good policy to use a meat thermometer to check the temperature of the thigh meat when you think the bird is done. If you have stuffed the bird be sure to remove the stuffing completely and don't leave it sitting in the turkey as it cools down. The size of turkey I use is usually in the 14 - 16 pound range and from fresh I have always found it to be perfectly cooked in about 3 hours and 15 minutes. Before putting it in a preheated oven I lightly brush it with either butter or vegetable oil and generously season the skin with salt and pepper. I have seldom found it requires basting when cooked for the 3+ hours at 325 degrees. I should mention, I do not stuff our turkey. I always leave the turkey, covered lightly with foil, on top of the stove to 'rest' for about 20 - 30 minutes before carving as I find this tends to 'set' the meat and make for easier cutting. The meat tends to fall apart if I attempt cutting it straight from the oven. The other requirement for our traditional Christmas Dinner are garlic & cheese potatoes which make a suitable addition to the roast turkey. I usually do this dish the day before and finish it in the oven for about 45 minutes before I expect to put the turkey on the table. In a large pot I put as many cut up potatoes as I think will be enough for Christmas dinner and also leftovers for boxing day. A good rule of thumb is one large potato per person and then one more for good measure. By large I mean a baking size Russet. To the potatoes and salted water I add several ( up to your taste) cloves of peeled garlic which cooks along with the potatoes. When the potatoes are done I mash them while they are still very hot being sure not to throw out the garlic with the pot water. I will also add some butter at this time to smooth the potatoes and then will quickly mix in 2 well beaten eggs. You have to do this quickly or you will wind up with scrambled eggs, which is not the desired effect. I have not found it necessary to use either milk or butter as the egg seems to give the potatoes a good consistency and also provides some 'lift' when the potatoes go into the oven. At this point I mix in a very generous portion of sharp grated cheddar cheese, and I do mean generous. When this is well blended I spoon the potatoes into a greased 9 x 13 glass dish and finish the top with a light coat of butter and some more cheese sprinkled over the top. A light sprinkle of paprika also provides a nice finished color to this dish if you like. This dish can be made the day ahead and kept in the fridge until needed. I take it out of the fridge about two hours before going into the oven so the glass dish is not going from ice cold to a hot oven in one move. I am told you can go from fridge to oven with Pyrex but I have never personally tried it, as I have always felt a broken glass dish is not the perfect companion for Christmas Dinner. In a 350 degree oven the potatoes (which are already cooked) are usually heated through within 45 - 60 minutes. You can tell they are done when the potatoes begin to 'rise' and the top is a nice golden color with the cheese well melted. Usually the vegetables to accompany our Christmas dinner will include brussel sprouts (not everyone's favourite), brown sugar glazed carrots, baked sweet potatoes and green snap peas. While not really a veggie, there is of course whole berry cranberry sauce for those liking it with their turkey. Some might think the lack of gravy unforgivable, but I have found that with the cheese potatoes smothered in butter and the juicy fresh turkey that gravy is not really necessary. I will use the pan drippings for gravy on boxing day which I use on my leftover turkey casserole which uses up a good portion of the leftover turkey. Since I do not stuff our turkey, but the meal would not be complete without dressing I have taken in recent years to using the store bought, stove top stuffing, which while it is not as good as home made we find an acceptable substitute. The meal is washed down with either a white wine or our new favourite, white cranberry juice. On the off chance that anyone can still move after our Christmas feast, there will always be a choice of mince meat tarts, pecan tarts, shortbread and nanaimo bars for dessert. It has been scientifically proven that turkey contains a good source of portein and is an unusually high source of vitamin zzzzzzzzzzzzzzzz! If you have a spare $15 million under the mattress and you want a home a little above the ordinary, this 15,000 square foot home on it's own peninsula in Oak Bay may be just what you are looking for. It boasts the usual gourmet kitchen, home theatre, billiards room, attached executive office, boat house, sandy beach, 400 amp generator, desalination plant and 17 heat pumps to keep you comfy. If you think you might want to buy this 'move-in ready' home, or just want to see how the other .5% live check out this Huffpost article HERE. If you can put 20% down, your monthly mortage would only be in the neighbourhood of $47,000.00 which is principle and interest only. The City of Nanaimo and the International Association of Fire Fighters, Local 905 have ratified a new Collective Agreement covering the period from January 1, 2016 to December 31, 2019. The agreement includes wage increases of 2.5% each year which is the pattern for IAFF settlements established throughout the province. The parties are pleased that an agreement could be achieved without the use of a mediator or interest arbitration. This is the first time since the mid-1990’s that the parties have reached agreement in advance of the existing collective agreement’s expiry date. This agreement will ensure predictable labour relations costs for the next four years, and the process through which the parties achieved it has enhanced existing relationships. During its December 16th Special Council Meeting, Council adopted the City of Nanaimo's 2016-2020 Financial Plan. The plan's adoption allows Council to set spending limits for programs and services for the next five years. Staff will now proceed forward in developing work plans for 2016 and preparing for 2016 capital projects. The total 2016 Budget is $157.7 million - $122.5 million to fund operations and service programs and $35.2 million to fund capital projects. A 0 per cent increase in the property tax rate for 2016. $945,000 in funding for general asset management. User fee increases of 5 per cent for sewer, 7.5 per cent for water and 1 per cent for garbage. Savings of $816,000 in 2016 through executive downsizing; eliminating the general manager group and freezing other vacant exempt positions. This will save the City about $4.2 million over the next 5 years. Provide $150,000 in funding for four members per engine in the Fire Services Department. Provide $230,000 in funding for a citizen survey and strategic planning exercises in 2016. 2016-2020 Financial Plan will be amended in April/May of 2016 to incorporate property tax and funding requisitions from the Regional District of Nanaimo; Vancouver Island Library; and others. Council will consider and adopt the 2016 Property Tax Bylaw in April/May 2016. Visit their website for more information about sponsoring and promoting Operation Red Nose and how to volunteer with the program. At the December 7, 2015 Special In Camera Council meeting, Council provided its support to the Nanaimo Port Authority's (NPA) November, 27 announcement to issue a Request for Proposal (RFP) for a foot passenger ferry service between Nanaimo and Vancouver. Council believes that both the City and the NPA will benefit from working together in an effort to see a foot passenger ferry service created. It is therefore in the City’s best interest to support the NPA with a joint RFP. Council supports an open, collaborative and transparent RFP process in the development of a foot passenger ferry service between Nanaimo and Vancouver. A collaborative approach involving a number of local organizations working together, including the NPA, Snuneymuxw, the Regional District of Nanaimo, the Nanaimo Economic Development Corporation and the City, has many benefits, including the coordinated development of Nanaimo's waterfront. Moving forward, Council hopes that Island Ferry Services Limited will participate in the NPA's RFP process with a strong proposal. Some calls for service will be handled over the phone while others require officers, sometimes 2 or 3, to attend, for several hours, to find out what happened and conduct the appropriate follow ups. Many files will stay active for months if not years while it works its way through the criminal justice systems. Regardless of the call, whether it is from a concerned citizen who hears noises in their yard late at night, a 2 car motor vehicle incident with injuries or persons fighting, each must be dealt with professionally and given the attention and service, the general public has come to expect and deserves. "Looking at the list of calls, it is clear the Nanaimo RCMP relies heavily on various municipal, provincial and federal agencies to carry out their duties. All of these agencies are dedicated professionals who are called upon daily to assist our officers. They work long hard hours and hopefully they too will have some time to decompress and enjoy the holiday season”, said Constable Gary O'Brien of the Nanaimo RCMP.